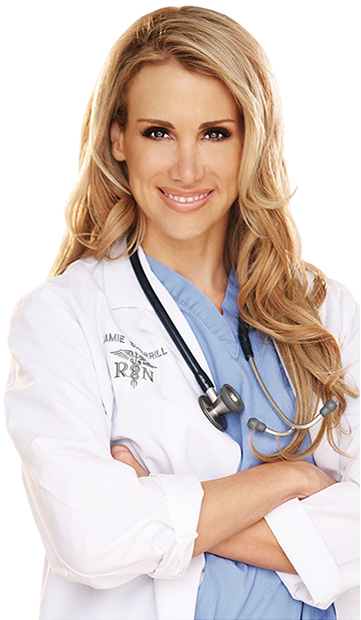 As a celebrity skincare expert and Registered Nurse, Jamie is recognized as one of the top beauty professionals world wide. While Jamie has been owner of Beauty Park Medical Spa in Santa Monica, she has also worked for years as a consultant to some of the top spas around the world and garners a long list of celebrity clientele. Her always-evolving knowledge of the latest innovations in beauty combined with her personable demeanor and medical fortitude make her the go-to girl for many celebrities. Many of Nurse Jamie’s clients repeatedly end up in features like People Magazine’s annual “Most Beautiful” list. Jamie is a regularly featured beauty expert on ExtraTV and E! News and is a frequent celebrity skin advisor for shows like The Doctors, Revenge Body with Khloé Kardashian, The Today Show, Good Day LA, and VH1’s Hollywood Exes. She was also a series regular in the fifth season of The Simple Life with Nicole Richie and Paris Hilton as the resident nurse throughout the season. Jamie’s love of beauty began as a teenager, thus allowing her the opportunity to view the multi-billion dollar industry firsthand from the ground up. She was hand selected early on to be on an elite list of experts, a ‘technological task force’ to test the latest in laser technological advancements. Her expertise has not only kept her at the forefront of medical aesthetic improvements, she has also mastered the “injectable facelift,” a combination of dermal fillers and paralytics, and is an instructor with CME Scholar/Allergan where she educates others on the latest innovations and proper techniques for administering Botox and Juvederm. Armed with this expertise, Jamie has utilized her knowledge to create products to help clients fight the signs of aging allowing them to put their best face forward. As a spa director in luxury locales like Abu Dhabi, and Cabo San Lucas, she is now recognized as a global brand, and her skincare products and expertise are now available throughout the world. Jamie lives in Pacific Palisades with her triplet children. Yes, triplets!!! ©2019 Beauty Park Medical Spa & Nurse Jamie, Inc. All Rights Reserved. For all orders of $99 or greater, ground shipping is FREE to addresses within the continental United States. To take advantage of this offer simply select the Free Shipping option at checkout. Please enter your email address below. We will send you an email to confirm your password. And be the first to know about spa sales, new procedures and more! Your email is safe with us, we don't share emails! Sending mail... Thank you for contacting us! There was an error. Please try again. Please complete all required fields.